Entner Electronics has released a new zoom-block camera for embedded vision applications. The UC-310 is a compact software programmable camera with proprietary electronics and a high quality zoom lens for unprecedented image quality. The new camera uses a rolling shutter STARVIS sensor to offer a high sensitivity and dynamic range in visible light conditions. The read-out electronics are optimised to reduce the rolling shutter artefacts by a factor of two compared to current industry standard cameras . This allows integrators to benefit from the advantages of rolling-shutter sensors such as the use of compact, weight reducing optics. 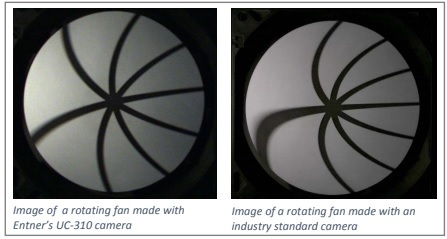 To show the effects of Entner’s read-out electronics a rotating fan was recorded comparing Entner’s UC-310 camera with an industry standard camera in parallel. Both images are acquired at 1080p/60. Clearly visible at comparing the images is the reduction of the ‘bending’ artefact when recording fast moving objects. The UC-310 camera is compatible with the industry standard VISCA communication protocol to allow for hassle free upgrading of existing imaging systems. The onboard ARM-based processor offer the user the possibility to integrating DSP functionality in the camera such as object tracking, OSD generation, file management systems and many more.